Last night I participated in the live Garden Chatter via Google Hangout with terrific hosts Brenda of #GardenChat fame and Adam Cortell of Digging the Garden. My fellow guests were Linda Ly of GardeningBetty.com and Scot of GottaGrowit.com. We discussed our gardening successes and failures from the past year and also what we look forward to growing in 2015. What are YOU planning to grow new in the next year? 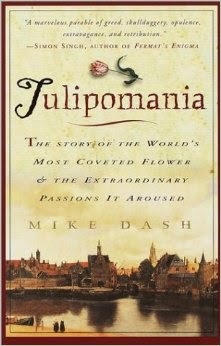 For our first 2015 selection, we will be reading: Tulipomania by Mike Dash. I have reserved a meeting room at the Shepherd Park " Juanita E. Thornton" Neighborhood DC Library for Tuesday, February 10 from 6:00-7:30pm. The library room allows food and drink and you may bring your dinner and/or snacks to share. The book club meetings are FREE and open to anyone who would like to attend. Please RSVP to "WG Book Club" at WashingtonGardener@rcn.com. I will be limiting attendance to 20. If you need to cancel, let me know ASAP so we can give your spot to someone else, should we have a wait-list. I will announce the date for the next book club meeting's date and location after each previous meeting. We will meet roughly once each quarter/season. Season's Greetings 2014 from Washington Gardener Magazine! 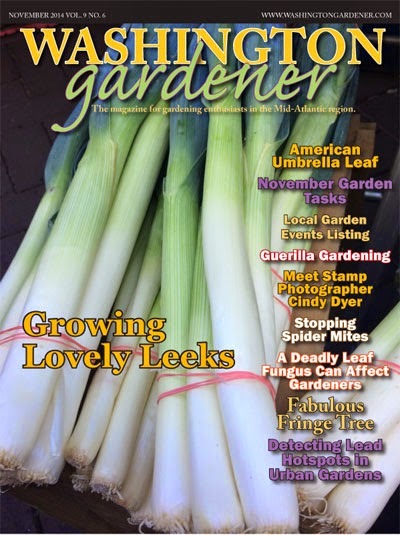 Washington Gardener is the magazine for gardening enthusiasts in the Mid-Atlantic region. The December 2014 issue is being sent now as a PDF to all current subscribers. Note that any submissions, event listings, and advertisements for the January 2014 issue are due by January 10. SUBSCRIBE TODAY by using the link at the top-right of this blog page. Video Wednesday: The Flower Show “Celebrates the Movies"
Here is a preview of the 2015 Philadelphia Flower Show: Lights, Camera, BLOOM theme. Personally, I cannot WAIT for the combination of my two passions -- gardening and movies! Registration and details on our trips will be posted in the next few days. Save the dates and stay tuned! In addition to the Hellebores, I have PJM Phododendron and pansies going strong outside. Inside I have an assortment of typical holiday plants -- Paperwhites, Poinsettia, etc. along with a few violets and geraniums hanging on in bloom. 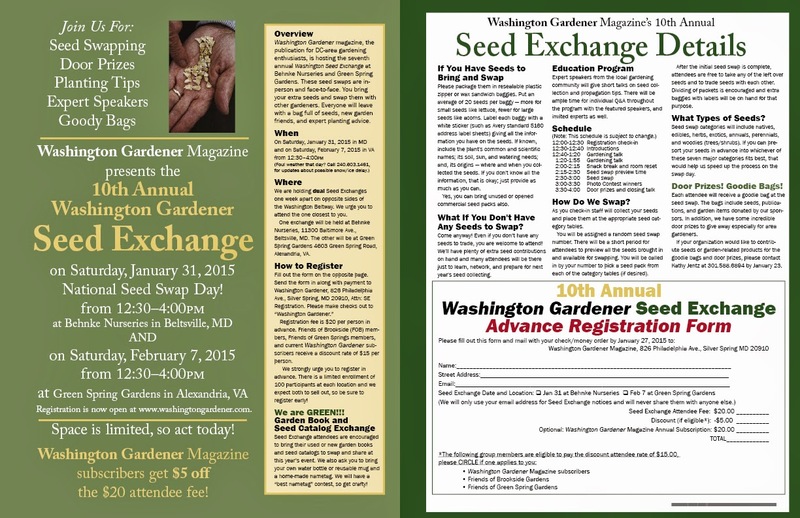 The 10th Annual Washington Gardener Seed Exchanges, hosted by Washington Gardener Magazine, takes place on January 31, 2015 at the Behnke Nurseries in Wheaton, MD AND at February 7, 2015 at Green Spring Gardens in Fairfax, VA. You can attend both or you have a choice on which side of the beltway you want to attend! Seed Exchange attendees trade seeds, exchange planting tips, hear expert speakers, and collect goody bags full of gardening treats. Registrations are streaming in now and we expect a sell-out of both locations. We urge you to pre-register to guarantee yourself a spot. The event also includes such “green” features as the garden book and catalog swap. Participants are encouraged to bring their gently used garden books and mailorder garden catalogs to trade with each other. Any leftover publications at the end of the swap are donated to the National Agriculture Library in Beltsville, MD. The first annual Washington Gardener Seed Exchange was held on January 26, 2006. After that event’s success, seed swaps in other cities across the nation have joined in celebrating National Seed Swap Day each year on the last Saturday in January. 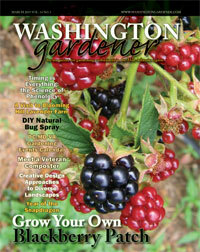 Subscribers to Washington Gardener Magazine receive a $5 discount off the admission to the Washington Gardener Seed Exchange. The registration form is posted below. Please print it page 2 and fill it out, then mail it along with payment by January 25 (see update note below) to Washington Gardener, 826 Philadelphia Ave., Silver Spring MD 20910. UPDATE 2: We still have some spaces left, so you may register on-site at the Washington Gardener Magazine 2015 Seed Exchange on Saturday, January 31 12:30-4pm at Behnke Nurseries in Beltsville, MD. On-site Registration opens at 12:00noon. The program begins promptly at 12:30pm. We recommend that you print out the registration form and fill it in and bring it along with a check made out to "Washington Gardener" in order to speed things up and keep the registration line moving quickly. We also still have spaces left for the Seed Exchange on February 7 at Green Spring Gardens in Alexandria, VA. You can still mail in your registration for that, please ensure that it will arrive by February 5. And yes, you can attend and participate, even if you have no seeds to swap. We always have plenty of extra to share with new and beginning seed starters! 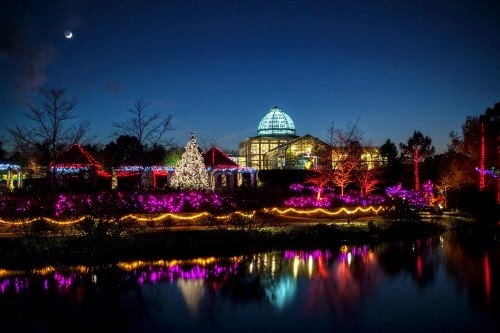 For our December 2014 Washington Gardener Reader Contest, Washington Gardener is giving away a family 4-pack of tickets to Dominion GardenFest of Lights in Richmond, VA.
To enter to win the family 4-pack of tickets to the Lewis Ginter Gardenfest of Lights, send an email with “Gardenfest of Lights” in the subject line to WashingtonGardener@rcn.com by 5:00pm on Friday, December 19. In the body of the email please include your full name, email, and mailing address as well as your New Year's gardening resolutions. The ticket winner will be announced and notified by December 21. Red Osier Dogwood (Cornus sericea), can be a bit unruly during the growing season. The two in my backyard tend to flop as the season progresses, perhaps because the large shade leaves weigh down the slender stems. Once the leaves fall the stems return to a nice upright position. This is the time of year when these shrubs come into their own, the red stems providing winter cheer, especially when highlighted against snow. 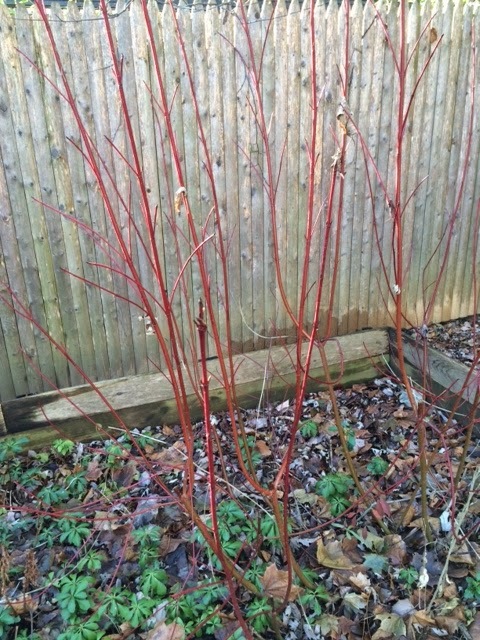 I usually prune my Red Osier Dogwood pretty hard in February, to encourage new growth and bright stems. The tradeoff is that I don’t get flowers, since they bloom on new wood. This year I plan to experiment with cutting a few older stems to the ground and leaving others. Even though the floral display is not considered this shrub’s strongest feature, it would be nice to have some blossoms, as well as berries for the birds. This spring I learned by accident just how easy it is to propagate these plants. I decided to use some of the trimmed stems to make a funky little trellis for my pea plants. I put three stems upright in the ground, and loosely attached some stems to them horizontally, using several of the shrub’s flexible small twigs to tie the pieces together. Later in the spring I noticed that leaves were unfurling on one of the upright stems. Voila, I had inadvertently started a new dogwood in my vegetable garden! Red Osier Dogwood is a native that is widespread throughout the U.S. except for the southern states. It likes moist soil, but should do well in all but the driest areas, and can handle a range of light conditions from sun to shade. Plant these shrubs where you can seem them from a window in winter and they are sure to lift your spirits in the dark months. Rachel Shaw focuses on vegetable gardening and growing native plants in her small yard in Rockville, MD. She blogs at http://hummingbirdway.blogspot.com/. This guest blog post is part of a monthly Native Plants series that Rachel authors for Washington Gardener Magazine around the 10th of each month. Watch this lovely video from Casey Trees as it shows the transformartion of The Park at LeDroit in Washington, DC, through the gift of trees and community volunteerism. I'll be giving this Local Gardening Talk Series on Capitol Hill at the Hill Center next March-April. Sign up soon to reserve a space. Repeats every week until Mon Apr 13 2015 (except Mon Mar 16 2015). Join Kathy Jentz of Washington Gardener for this wonderful 5 class series as she helps you prepare your garden for Spring. These classes are great for non-gardeners and expert gardeners looking to brush-up. Register for the entire series HERE. What annual garden festivals are worth attending? Which public gardens fit my needs? What are the best places to shop? Where do I find out more? You will receive a special reference handout listing local gardening classes, shows, public gardens, web sites, garden books, and much more. Plants that have proven themselves in the Mid-Atlantic. Low-maintenance gardening is the goal of many of us in our busy lives and the key is planting the right plants got our local climate. We'll talk about some native plants, of course, but mostly we'll explore the tried-and-true plants that can take clay soil, deer, and/or periods of drought. Season-by-season, we'll share our favorite plants that excel in our local gardens. Can you feel the difference in the air? Birds and buds are waking up as spring fast approaches! There is so much to do in the garden, but where to begin? We'll look at what to tackle first, what can wait, and what you need not bother with at all. Get organized and get inspired for a new growing season ahead. Using examples from area gardens, Kathy Jentz, editor and publisher of Washington Gardener magazine, will illustrate basic design principles for maximizing garden space. 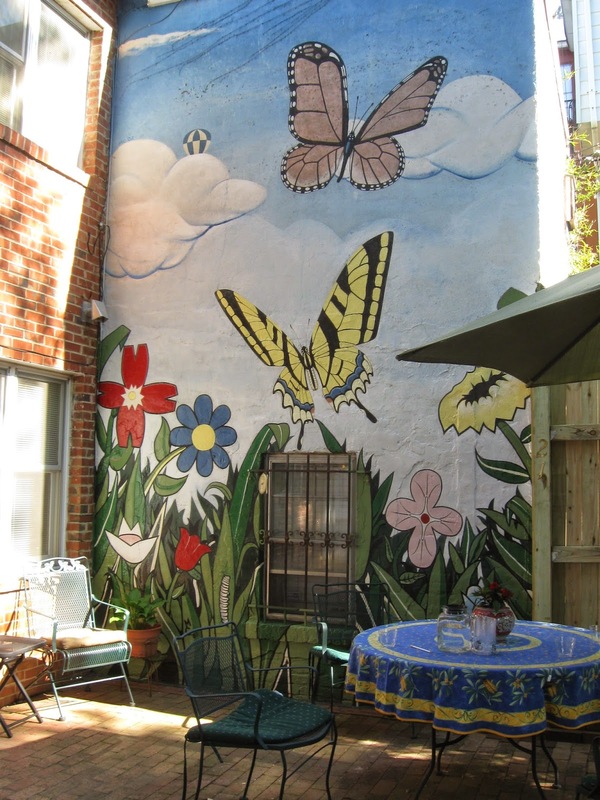 Kathy will address common small-space challenges such as creating privacy and adding light to shady areas. She will also give ideas for low- or no-budget solutions. 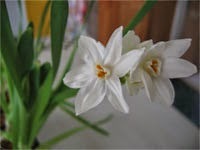 Paperwhites (Narcissus papyraceus): You Can Grow That! 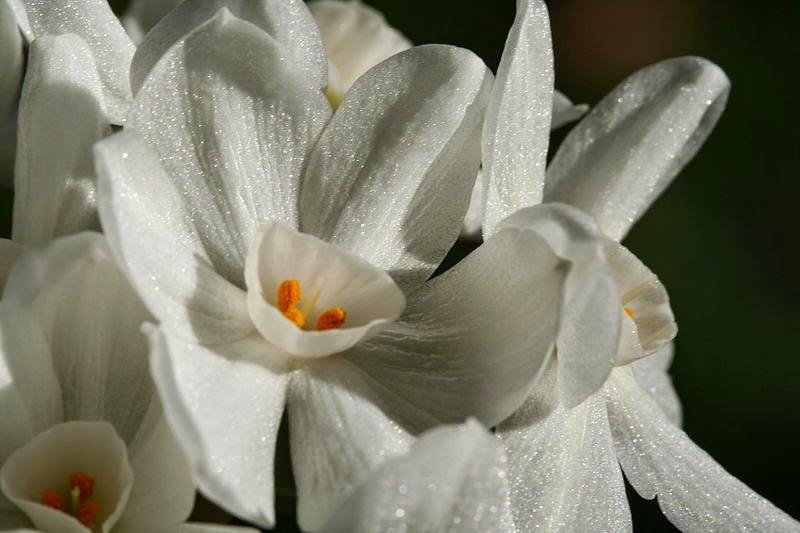 Paperwhites (Narcissus papyraceus) are a great holiday season project for beginning gardeners and for doing with children. 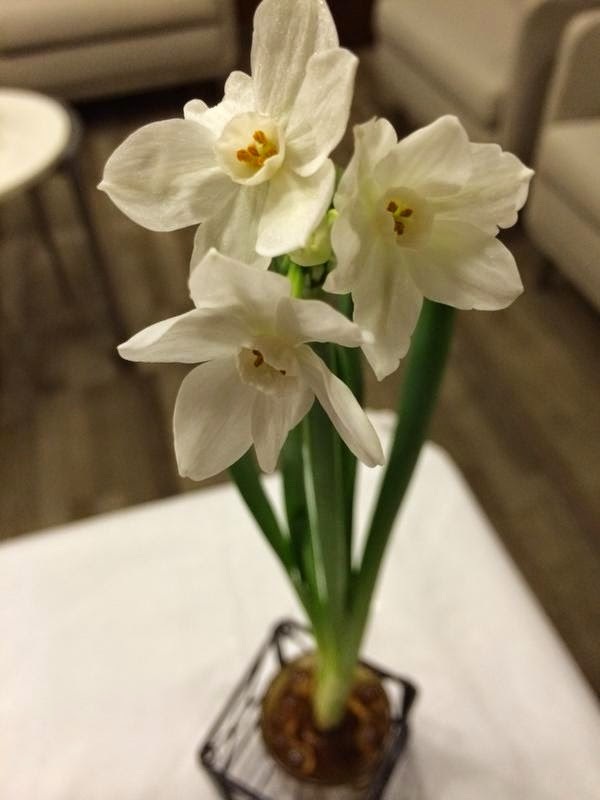 These Mediterranean bulbs are pre-chilled for you so they are virtually ready to "pop" once you place them in water. They are generally inexpensive, around $1-2 each, so you can buy several and pot them up as gifts for everyone on your list. I like to place them individually in votive candle holders or heavy-bottom rocks glasses then line them up on windowsills, down the middle of a dining table, along the fireplace mantel, or singly next to the bathroom sinks. You can also take a large glass bowl or tall vase and place several bulbs in together to make a forest of paperwhites. I have used fishbowls, teapots, and old watering cans. Really anything that is water-tight can be used, so look around your home for inspiration. To anchor the bulbs in and preventing them from toppling over as they grow leggy, you can place the bulbs in a variety of decorative media from aquarium pebbles to glass marbles. (You can always use potting soil to plant them in, but that is messy and not as pretty, IMHO.) I like to use hydrating water beads that you can get from florist supply and craft sources. They come in many shades, but I tend to stick with the classic clear ones. Whatever media you use, keep the water level only up to about the bulbs hip area so as not to rot it. If your home is as dry as mine in winter, you will need to top off the water every few days, so keep an eye on that. Once "potted," place them in a sunny window until the leaves emerge and a stalk with flower bud started to form (usually about 10 days to 2 weeks), then place them wherever you'd like to display them. After the flowers start to fade, pull the bulbs out of the water and pry off any marbles/stones/glass that you want to re-use next year then throw out the whole plant in your compost pile. In our Midatlantic USA region, they are not winter-hardy so there is no need to try and plant or save them for next season. A short documentary video produced by Docs In Progress Intro to Documentary Production students Jihan Madyun, Peggy Tevis. The video profiles Button Farm, a living history center in Germantown, MD. People of all ages come to learn about 19th century slave plantation life and the heroic story of the Underground Railroad. Now available! 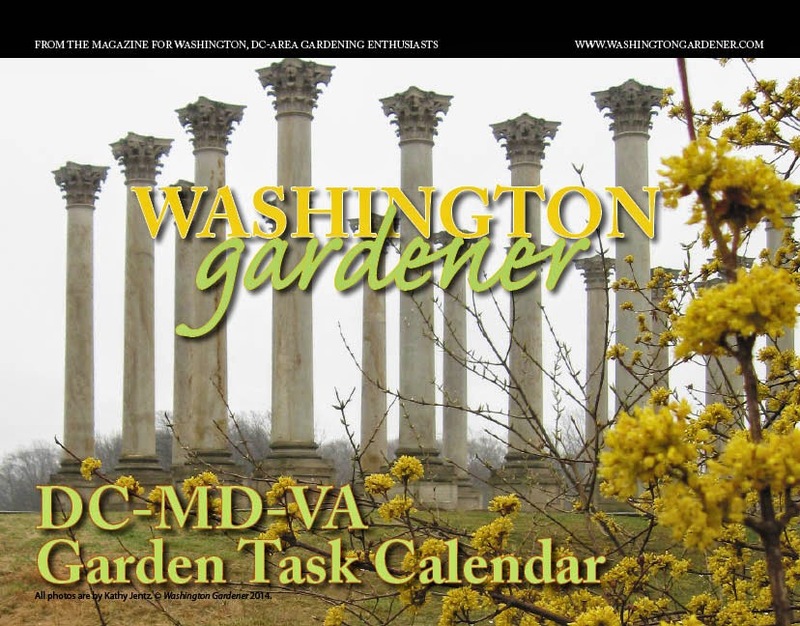 The Local DC-MD-VA Gardening Task Calendar 2015 from Washington Gardener Magazine. 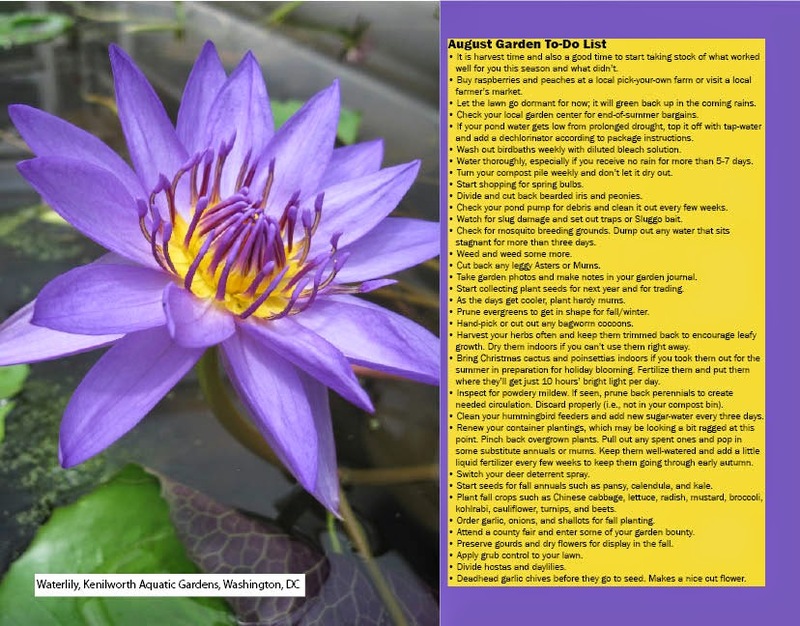 It includes monthly task lists for local DC-MD-VA (zones 6-7) gardening and photos of gorgeous flowers from Washington, DC-area public gardens. All new art for 2015! The calendar is a great gift for yourself and any area gardeners you may know! NOTE: Be sure to specify on the initial order page what month you wish to start the calendar with as you can customize it for any 12-month-span you like. "From Maryland, Jan Kirsh has worked with Eastern Shore clients to help them with residential landscape designs so that their outdoor living spaces are places of beauty and respite. She also creates fruit and vegetable sculptures in any size out of oil-based clay, then cast and fabricated in materials suitable for indoor or outdoor displays. 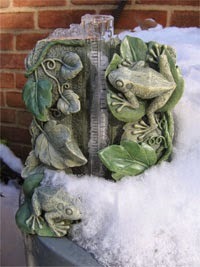 Similar to her signature landscape designs, her sculptures express exuberance and joy. 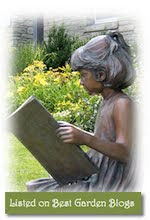 This morning she will share some of her ideas for landscape design and incorporating sculpture in the garden. 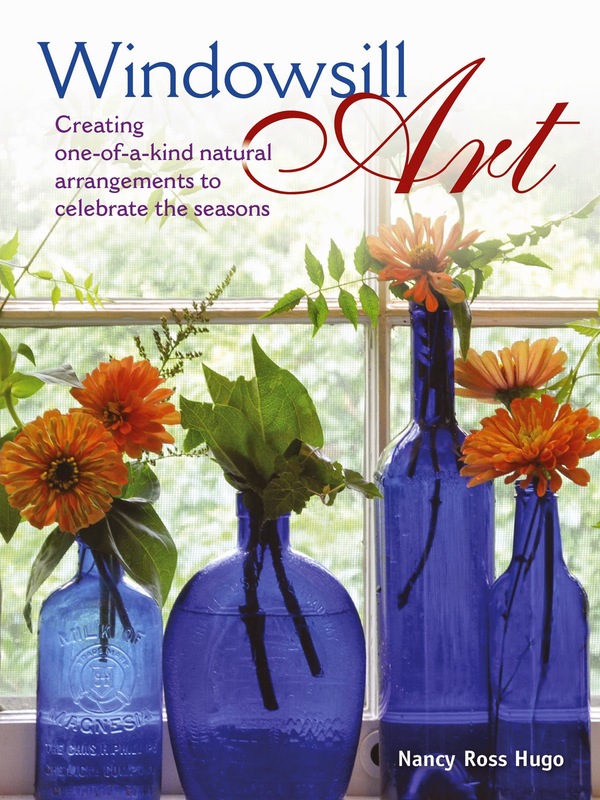 Visit her website at jankirshstudios.com..."
For our November 2014 Washington Gardener Magazine Reader Contest, Washington Gardener is giving away a copy of Windowsill Art: Creating One-of-a-Kind Natural Arrangements to Celebrate the Seasons by Nancy Ross Hugo (retail value: $18.95). Local Virginia author, Nancy Ross Hugo, demonstrates how to use the windowsill as a platform for small, simple displays that celebrate the seasons and reflect the personal style of their creators. Her fresh approach uses bottles, jars, and other small vases to showcase arrangements of locally collected leaves, seedpods, flowers, fruits, and twigs. Windowsill Art is published by St. Lynn’s Press, an independent publishing company based in Pittsburgh, PA. See the review in the curreny Washington Gardener Magazine issue on page 10. To enter to win the book, send an email to: WashingtonGardener@rcn.com by 5:00pm on November 28 with “Windowsill Art” in the subject line and in the body of the email please also include your full name and mailing address. Tell us: “What is your favorite way to decorate your windowsills?” The book winner will be announced and notified by email by November 30. Congratulations to our "Windowsill Art" book winner: Leah Cohen of Winchester, VA! Please be sure to enter our next reader contest. Enjoy your Thanksgiving holiday week! 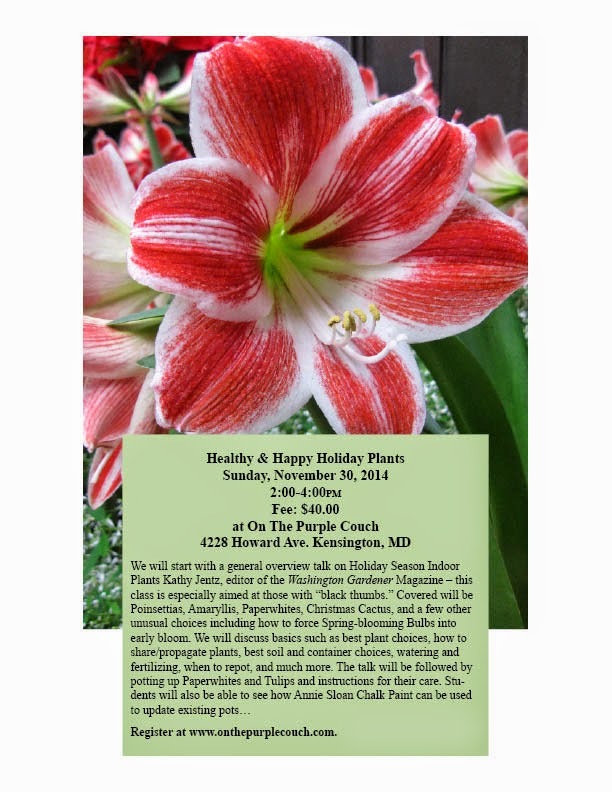 I have two upcoming classes at One The Purple Couch in Kensington, MD. See the flyers above for full details (click on them to see at full size) and also visit http://www.onthepurplecouch.com/ to learn more and to register. The class on November 30 is all about Holiday Plants and include bulbs two-ways -- Paperwhites for now and Tulips forced for enjoying later. 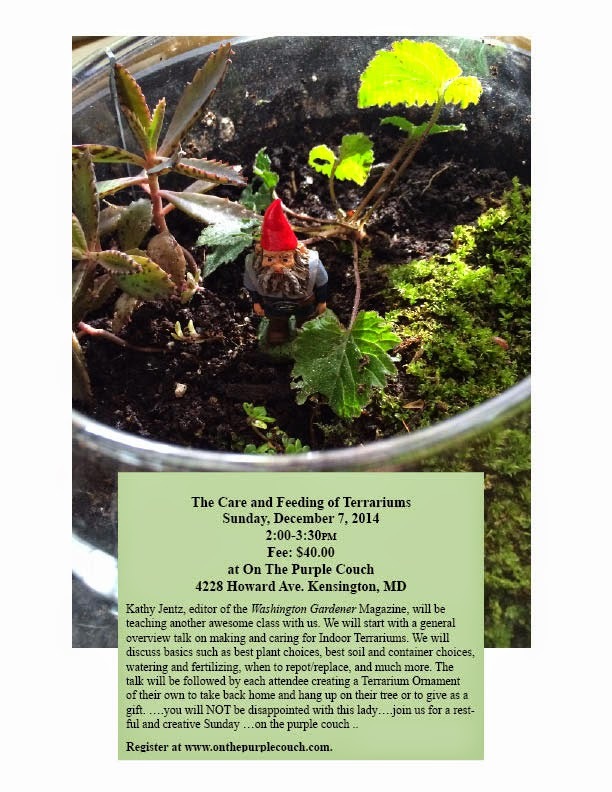 Then, the class on December 3 is all about Terrariums and we'll make some lovely Terrarium Ornaments together. Tonight, On the Purple Couch is having an open house from 5-9pm and I'll be there with a table previewing both classes as well as selling our "Keep Calm and Garden On" buttons and magnets, current and back issues of the magazine, and demonstrating what you'll make in the classes described above. There will also be other demos and pop-up shops so come out and bring your friends for a lovely pre-holiday evening! The November 2014 issue is being sent now as a PDF to all current subscribers. Note that any submissions, event listings, and advertisements for the December 2014 issue are due by December 10. Didn't get all your bulbs planted before the ground froze? Don't discard them! Instead pot them up for indoor forcing and enjoy an early springtime in the depths of winter. 4. Cold Storage/Removal for Flowering. Place the potted-up bulbs in cold storage for about 12 weeks. Cold storage should be roughly 40-50 degrees and without light. Storage areas might include your basement, garage, or the crisper drawer in your refrigerator. Different bulbs have different cold cycle times but most are between 12-16 weeks. (Tulips need the most time at a full 16 weeks.) Mark your calendars so that you don't forget about them. When you first remove them from storage, place them in indirect light and away from a heat source to prevent "legginess." After two weeks, when they have sprouted and are several inches high, move them to a sunny, warm window. Once a flowerhead or bud starts to develop, you can then move it to your desired location with indirect sunlight to prolong the bloom life. Keep them watered regularly as soon as you remove them from cold storage. Enjoy! This Garden Blogger's Bloom Day is frigid. It feels more like the dead of winter than late autumn here in the Mid-Atlantic USA (zone 7). One bright spot is this Azalea, one of the reblooming Encore series. I was sent it as a trial plant years ago and it is finally living up to its name and giving reliable blooms all year round. Also still in bloom in my garden, despite the deep freeze, are sunflowers, salvia, snapdragons, pansies, alyssum, and Nippon daisies. It is official. The polar freeze came through last night and the summer crops in my plot at the Fenton Community Garden are done. I'll be ripping them all out and putting down a layer of compost then mulching with straw. At this point I'm calling the plot "done" for the season. I still have some onions and garlic bulbs to put in and some more hardy greens I want to start from seed. I will also be continuing to harvest from my cool season crop beds that include broccoli, cauliflower, kale, Brussels sprouts, arugula, parsley, radishes, and carrots. This will be my last Fenton Friday report for 2014. Look for the weekly community garden plot updates to start back again next March. Keep checking this blog though for news on the upcoming Seed Exchanges, trips to the Philadelphia Flower Show, Garden Photo Contest, and much more! This week's video on Shutting Off Water Sources is incredibly timely with a huge cold front moving into the Mid-Atlantic area. If you have never had trouble with a water pipe freezing and bursting, count yourself lucky. I hear many horror stories from new homeowners who were never told they needed to turn off their outdoor water for winter nor even where the shut-off valve is -- if you don't know where that valve is, make it a point to find where yours is today! This week at my garden plot in the Fenton Community Garden we dodged the frost/freeze that hit points south and west of us, but it looks like this weekend may may dip to the '20s and that may be that. As you see pictured below, my tomatoes are still producing well, but I think the flavor is really lacking and I may just pull them out, even if we don't get hot by this predicted frost. Elsewhere in my plot, the cool season crops are revving up. The Broccoli and Brussels Sprouts are heading and my goal of having them by Thanksgiving to feast on is looking actually realistic! I harvested my one and only Kohlrabi today as I doubt that it will get much bigger and, well, I wanted to see what it tasted like. I eat mine peeled, then cut up raw with a ranch dip. How do you like your kohlrabi? Watch Norfolk Botanical Garden’s Les Parks as he reveals the NBG top 5 summer annuals from this past season. I totally concur with Coleus 'Redhead' -- mine keeps going on and on. Keep this list handy for next year. Herbaceous Peonies are among my favorite flowers. Peonies are easy to grow and will reward you with armfuls of luscious blooms every May-June. Once established, the only care they need is to have the old foliage cut back in fall. Select a sunny, well-draining spot in your garden for peonies. Be sure to give them space to grow as well as this perennial grows to shrub-like proportions in a single season. Having said that, herbaceous peonies really do play well with others in your perennial borders and combine well with roses and clematis. The only "trick" to herbaceous peonies is to not plant them too deep. When you get a peony root division, you will see the red-ish "eyes" (new emerging plants). Plant them with the tips of the roots pointed downward andthe eyes set just an inch or so below the surface of the soil. Amend the planting hole with peat. Then mulch it over with leaf compost. Do not add in any fertilizer. Herbaceous peonies are shallow-rooted so try not to dig or bother the plants too much around their crown area. When you weed, just cut them off at the soil level. You may have to give the heavy blooms some staking and support, but I find I cut them at the bud stage to enjoy indoors often enough to not have to worry about the characteristic peony flop. If an early summer storm is brewing and your peony is in full bloom, run out and cut all the blossoms that you can as a hard rain can often pummel and destroy these beautiful flowers. So disappointing to go out after a storm and see your peonies beaten to mush! Mid- to late-autumn is the best time to prune back the peony foliage to within a couple inches above the soil. Peonies don't need dividing and they actually resent being disturbed. But, if you want to separate and share them, do so in early fall for the best results. Pictured above is 'Do Tell' peony at Dumbarton Oaks in Washington, DC. As you have likely seen in my last blog post, we have a frost/freeze warning for the region this weekend. That means will soon be draining the cistern at the Fenton Community Garden, so I went over today and filled up over a dozen kitty litter and milk gallon containers to have water on stand-by over the long winter as I hate lugging it from home. 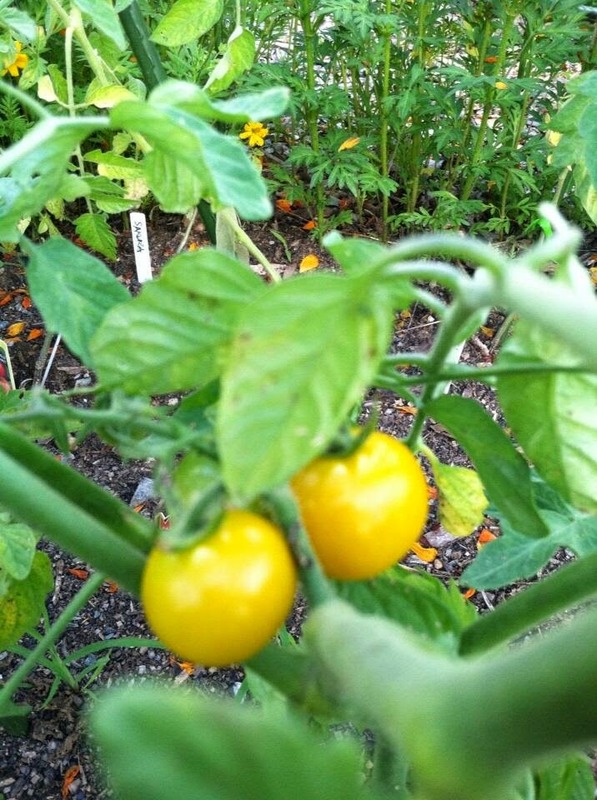 My tomatoes, especially 'Sun Gold' apparently love these cool nights as the plants have taken off like crazy and are crowding out my pathways and I picked over 30 ripe tomatoes today and had harvested another couple dozen earlier this week. All those that were split or green I left behind. We shall see if the forecasts are correct, but until they actually get frost-bitten, I'm leaving the tomatoes and other summer crops in the ground. In related news, garden writer Julie Bawden-Davis wrote up a piece on community gardening for Parade online. Read it here. I supplied here with a few quotes about my experiences as a childhood community gardener and more recently at the Fenton Community Garden. I thoroughly enjoyed reading about other garden writer's experiences as well. And now I know where C.L. Fornari gets all her energy -- it is all those fresh-grown veggies! Take it indoors. You may not have a greenhouse, but you probably have a garage, cellar, or protected porch. Sometimes all your potted tender plant needs is a sheltered spot for those worst weeks of the year. You can also wrap a blanket or burlap around the base of the pot to keep it insulated. Alternatively, group a bunch of pots together and stuff the area with leaves. Plant it right. The warmest part of your yard is most likely at the base of a southern-facing wall. This is the spot to plant your camellias, figs, and others in your zonal edge. Mulch it. Pile up mulch around the base of the plant to give its root-zone a nice blanket of warmth. Grafted trees and shrubs especially are vulnerable to die-back, so give an extra mulching to your fruit trees and rose bushes now. Be sure to pull pack that mulch layer at the first signs of spring. Cover it. If you have just a few small tender plants to cover or want to give an early start to next season, use a cloche or glass bell. 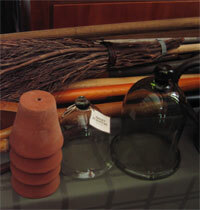 (An assortment of Colonial era cloches is pictured here.). You can make a modern cloche out of plastic soda bottles or milk jugs. Be sure to take them off or vent them during the day. To vent them, you can prop them up with a small stick or on stones. Blanket it. Watch the local weather closely and on the coldest nights of the year, have old blankets and sheets on the ready to throw over your plants. This is a good precaution to take on nights with an ice warning. Many plants that are solid Zone 6 and 7 can still suffer severe frost damage and breakage, so go ahead and cover them when an ice storm is predicted. Then uncover when the danger of icing has passed. Insulate it. Surround your most vulnerable plants with a metal cage (like your old tomato cages) or plastic mesh and stuff the frame full of leaves. You can also wrap the plant burlap tied with twine to achieve the same purpose. Then unwrap and unstuffy your plant in early spring. 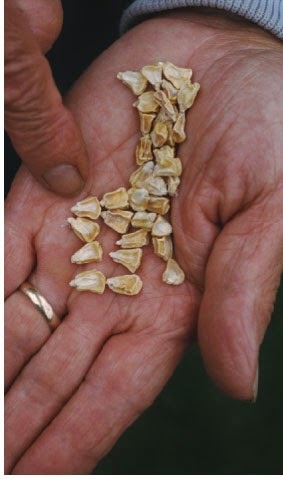 Speaking of Seed Saving, our dual Seed Exchanges are set for early 2015. In the drab, dreary heart of winter, join us for seed swapping, expert speakers, great goody bags, and much more. Save these dates: January 31, 2015 at Behnke Nurseries in Beltsville, MD and February 7, 2015 at Green Spring Gardens in Alexandria, VA. Registration and full details will be posted in early December. With the success of another year of the Washington Gardener Magazine Book Club, we are announcing our 2015 selections and schedule so that you can get a head start on obtaining the books and reading them. For our first 2015 selection, we will be reading: Tulipomania by Mike Dash. I am reserving a meeting room at a DC Library for a weekday evening in early February. (We will move the location around to various DC library locations near public transit for each meeting pending library staff approvals, the location will be confirmed to you when you RSVP.) The library room allows food and drink and you may bring your dinner and/or snacks to share. Yay! We got new plot markers this week at the Fenton Community Garden, which is great as the old wooden stakes were rotting and mine no longer could stand up. I find my new marker in the middle of my neighbor's plot and quickly moved it lest he think I was staking a claim on his Swiss Chard! 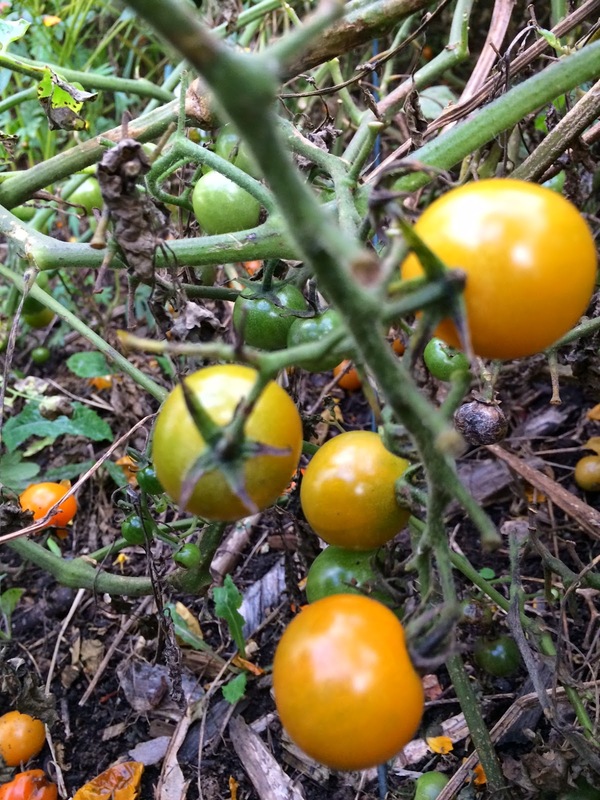 My plot is busting out of bounds, but I still have lots of tomatoes ripening and annual flowers blooming so I will keep stuffing cool season crops in around them as best I can. The photo above is an overview of the whole plot. Going clockwise from the top-left corner are: tomatoes on top pf potatoes, cosmos tangled with a morning glory vine, parsley and cilantro, cool season crops (broccoli, cauliflower, Brussel sprouts, kohlrabi, arugula, carrots, and radishes), strawberry with asparagus in the middle, a pot of hot peppers, a dying okra, marigolds, Swiss chard, celosia and lisianthus. I'm sure I've forgotten a few things, but that gives you a good overview and what a contrast to way back to the start of the season pictured here! Saffron Crocus (Crocus sativus) is the source of saffron that makes Indian curry and Spanish paella so special. You understand why this spice is so expensive when you see how tiny the red-orange stigma (female organs) of the flower are and that it takes dozens of these little threads to make enough to be used for one dish. This bulb is reliably hardy here in the Mid-Atlantic region (USDA Zone 6-8) and just needs good, well-draining soil and a full sun location. It is best to plant them in a bed that is not irrigated so they do not rot over the summer when they are dormant. Whether your bring them home from a local garden center or buy them via mial-order, the corms (bulbs) should be planted immediately upon arrival. As you can see in the photo above, the bulbs I received from DutchGrown.com were already sprouting and ready to go. This crocus blooms in the fall season and they are often lumped in with the autumn-blooming colchicums. However, colchicums are in the lily family and saffron crocus is related it iris, along with freesia and crocosmia. Even though the emphasis is on their culinary use, I think these bulbs hold their own just for their ornamental value. The blooms are a translucent purple with darker veining and a deep-purple center that make them a striking addition to any garden. This week at my plot in the Fenton Community Garden, we had another round of torrential rains (almost 3 inches dumped at once) along with tornado warnings and fierce winds. I did not get much time out in the garden, but did manage to dig up the one sweet potato I planted. It was almost 3 pounds worth from one tiny slip so I'm happy with that. It is now curing in my sunroom. I did notice that my brussel sprouts are taking off rapidly and I have high hopes of being able to harvest some for Thanksgiving! How is your edible garden growing? The October 2014 issue is now published and being sent as a PDF attachment to all current subscribers. Subscribe to Washington Gardener Magazine today to have the monthly publication sent to your inbox as a PDF several days before it is available online. The Mid-Atlantic is a big pumpkin-growing region. Here is a clip from the Virginia Farm Bureau on the big business of pumpkin growing. You don't need to be on Instagram to visit the page and view the photos, but I believe you do need an account to "heart" and comment on them. Do you share your garden blooms on Instagram? If so, share your account link in the comments page below. 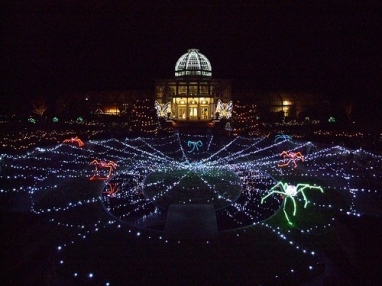 To enter to win a pair of passes, send an email to: WashingtonGardener@rcn.com by 5:00pm on October 16 10am on October 17 with “MD Holiday Show” in the subject line and in the body of the email, please also include your full name and mailing address. Tell us: “What is your favorite thing about gardening in Autumn?” The pass winners will be announced and notified by email by October 18th. Friday, October 17, 10 a.m. – 6 p.m.
More than 300 Exhibitors: Hundreds of knowledgeable contractors, landscapers, designers and house product gurus who will be showing off the latest trends in home improvement and answering questions about how to get started with, continue or add the finishing touch to home projects of any size. World-Famous Frisbee Dogs: The Disc-Connected K9s—four world champion, acrobatic dogs—will be making an appearance at the show. Spectators will watch world-class dogs jump, flip and catch Frisbees in a pawstively-perfect performance. Pet products will also be available for visitors to browse and buy in-between the Disc-Connected K9s’ shows. Holiday Crafts and Gifts: An array of unique, handmade products from juried craftspeople will provide shoppers with endless gift-giving options for everyone on their holiday lists—an awesome alternative to mass-produced gifts offered on Amazon. Landscaped Gardens: Visitors will walk through beautifully-landscaped seasonal settings that incorporate hardscaping, native trees and shrubs, and fall flowers into breathtaking garden displays. Tiny House by Sustainafest: The Annapolis nonprofit, Sustainafest, will be debuting its 210 square foot, student-built “Tiny House” model that demonstrates sustainable living practices for the home. Visitors can stop by the house to learn more about living sustainably, improving the environment and supporting the local economy. Designer Sport Caves: For those looking for inspiration in displaying their Baltimore sports pride at home, the show will feature three, model “sports caves” decked out in Ravens and Orioles colors and memorabilia. Attendees can learn how to transform their own small space into a Baltimore sports cave with ideas from professional interior designers. A Visit from Santa: Santa will be leaving the North Pole a little early this year to meet and greet children and read holiday stories on Saturday and Sunday from 11 a.m. – 3 p.m.
Wine Tastings: Guests can sample some of Maryland’s best wine from Boordy Vineyards, Far Eastern Shore Winery and The Winery at Olney while perusing vendor booths. Tickets to the Maryland Home & Holiday Show at the Maryland State Fairgrounds are $9 for adults, $7 for seniors, $3 for kids ages 6-12, and free for children under 6 years old. Free admission is also available for active military, police and fire employees with ID. The Maryland Home & Holiday Show is sponsored by M&T Bank.For more information on the show, visit http://www.mdhomeandgarden.com/fall or call (410) 863-1180. UPDATE: Because of the short notice on this event - we are extending the entry deadline to 10:00am on October 17.